There is an astonishing variety of things to do in Freeport Bahamas, and one of the most popular is exploring the amazing world beneath the sea, whether on a snorkeling or scuba diving trip or on a visit to the incredible marine habitats of Paradise Island. Deeply embedded in island history and folklore, the intriguing queen conch is one of the region’s most fascinating marine creatures. Conch are medium to large sea snails weighing up to five pounds and reaching lengths of up to one foot. 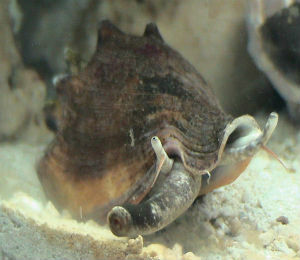 Belonging to the gastropoda class, conch are closely related to mollusks like oysters, clams, octopus, squid and clams. Perhaps the most well-known of the species is the regally named queen conch, a large sea snail living inside an elaborate shell with a spiked conical spire and shiny pink or orange interior. Prized for both their beautiful shell and their tasty meat, queen conchs are a huge part of Bahamian culture and cuisine. They also produce natural pearls that appear in a variety of lovely hues including white, orange and pink with a silky sheen and wavy pattern. The queen conch’s diet consists of various algae and detritus (broken down pieces of organic matter) that drifts to the ocean floor. Herbivores, they also eat various tiny marine plants. Conchs themselves have numerous predators, including nurse sharks, blue crabs, spiny lobsters, hermit crabs, starfish, eagle rays and other snail species. Queen conchs eat using a tongue-like organ called a radula which has thousands of tiny tooth-like protrusions called denticles. Queen conchs can be found in coral reefs, sand and the sea-grass bed in warm, shallow tropical waters throughout the Gulf of Mexico, the Florida Keys and the Caribbean Sea. They have been seen as far to the north and south as Bermuda and Brazil. Usually, the animal doesn’t live in depths over 70 feet, and while they populate sand flats and seagrass beds associated with coral reefs, they are seldom seen on the surface of the reef itself. Conch generally live 20 to 30 years, but have been known to reach the ripe old age of 40, with adult growth concentrated in thickening the shell instead of increasing in size, thus improving protection against predators. Though queen conch shells are brightly colored inside, the outside is sand-colored, designed to provide camouflage in their natural habitat. The queen conch’s life cycle begins when the female lays thousands of eggs in a sandy egg mass. After five days, the larvae emerge and drift off on ocean currents eating plankton for up to a month, finally finding a sandy habitat on the sea floor. During the conch’s first year, it hides under the sand during the day, emerging at night to feed at the surface. A relatively slow growing animal, it will take up to five years for a conch to reach full maturity. Unfortunately, overfishing and poaching has caused the queen conch population to decline, particularly in areas like Haiti and Honduras. The animal is highly desirable not only for its meat and use as fishing bait, but also for the high demand for the shells in jewelry or as conch trumpets and souvenirs.